For spinal cord injury advice, please visit our “spinal cord injuries” legal services page. Settlement for an 18 year old who was rendered a quadriplegic as a result of the negligence of a teenage driver who had been served alcohol at a restaurant. A national chain restaurant served a group of teenagers alcohol without carding any of them. 46-year-old machinist was rendered a T-5 paraplegic when another motorist pulled out in front of him from a private driveway. The case was complicated by a number of factors, including that the various defendants contended that the motorist was not in the course and scope of employment, that the intersection was not defectively designed, and that the motorcyclist was speeding and inattentive, since had he been traveling at the speed limit, he had sufficient time to avoid the collision. Nevertheless, we prevailed in obtaining sufficient resources for our client to satisfy his lifetime needs. Settlement in an automobile design defect case for a 31-year-old married mother of two who suffered a neck injury and subsequent C-5 quadriplegia. 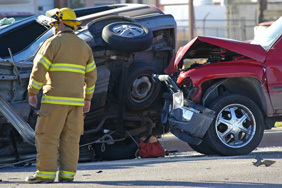 The plaintiff claimed her 1992 mini van was defectively designed because of its increased propensity to roll over, its inadequate roof crush resistance, and its defective seat belt system, among other problems. Destructive crash testing supported the plaintiffs’ allegations. The resulting settlement guaranteed the plaintiff and her family their economic security for life.